Custom wood garage doors, handcrafted by Montana Rustics, offer you or your clients something they can look forward to coming home to. Overhead garage doors don�t have to be a boring expanse of space . . . embrace the garage as a canvas, a space that is an extension of the home, a place worthy of arriving at. Choose between new woods, or capture the authentic with recycled and reclaimed woods with a history reaching back a century ago. Recreate historically accurate garage door designs that open upward with the touch of a button. Montana Rustics offers many custom wood garage door styles or the ability to design your own overhead door. 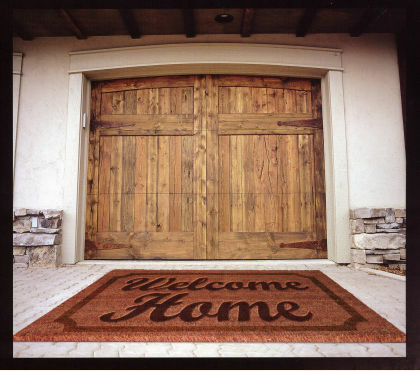 Whether you are blending the wilds of the west or embracing contemporary artistic flair in your door; you or your client will get the honor of driving up to a stunning, functional piece of history . . . every day. We didn't stop at style! Own a real piece of the past, or just check it out . . . Historically Accurate Garage Doors in Reclaimed and Recycled Wood . . .wood with a resume, that is! Submit your own old-time garage door picture for our archives!